We already know that 2019 is going to be a very expensive year for us. You see, we have three large pieces of equipment in three different convents in three states that need to be replaced. Repairing them is no longer feasible. It will cost just over $700,000 to replace all three. Would you be able to help us with this? Last year, because you were so giving, we were able to replace a water heater at Mt. 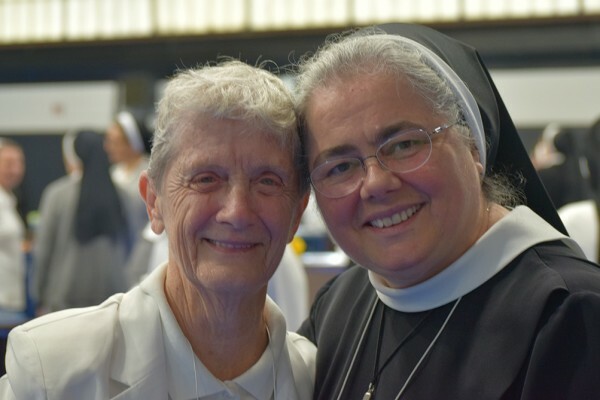 Nazareth Convent, Philadelphia, the outdated, faulty kitchen appliances in Grand Prairie, TX, and the aging, saggy recliners for our Sisters living at our Des Plaines, IL and Pittsburgh, PA convents (to name just a few things you helped us accomplish!). We can’t tell you how much our Sisters appreciate all that we were able to do because of your generosity. We’re hoping you can assist us again this year. First on our list of needs is a water chiller at Holy Family Convent in Des Plaines, IL, home to 25 Sisters and our Provincial offices. The current chiller unit, installed when the building was constructed in 1996, is leaking and no longer working properly. In fact, it’s so old that replacement parts are difficult to get. Since this unit serves as the only cooling source for the entire building, we must replace it. At Mount Nazareth in Philadelphia, PA, where 58 Sisters live, we need a new an air handler. The current unit, original to the building which was constructed in 1974, is rusted, no longer working reliably, and parts are no longer available. This unit serves as part of the heating and cooling system in the building. More importantly, this is the only unit providing fresh air into the various rooms within the building. Providing fresh air is critical in maintaining proper indoor air quality for our elder Sisters. During this past year, the fresh air output stopped working completely and the flow of cool and warm air into the major common areas is minimal at best. The third piece of equipment in need of replacement is the fire/carbon monoxide alarm system at Jesus the Good Shepherd Convent in Grand Prairie, TX, the site of Nazareth Retreat Center and home to 14 Sisters. The current system was installed when the building was constructed in 1974 and is obsolete. Just as with the others, replacement parts are no longer available. As you can see, these three pieces of equipment must be replaced for the health and safety of our Sisters. And we’re hoping you will be able to help us out as you have in the past. We do our best to be self-supporting, maintaining ourselves through salaries and small Social Security payments, but there’s usually not enough extra money remaining to care for our Sisters’ homes. We couldn’t make ends meet without your generosity. Your help also decreases our Sisters’ worry, allowing them to focus more fully on their ministries rather than wondering if there will be enough money each year to repair their homes. And so, on behalf of all our Sisters, we’re asking you for your help once again. Would you consider a gift to help us out this time? We assure you that any gift you give will be greatly appreciated and put to good use. You can make a secure donation using your credit card or bank account through our website by going to our DONATE page. Please make a note in the message/prayer request section that the donation is for our Annual Appeal. We can’t thank you enough for your assistance, your loyalty and your devotion to our Sisters. We count on caring friends like you to help keep our Sisters’ homes safe and in good repair. P.S. The average age of the 225 Sisters in our province is 73 years. Many of these Sisters have arthritis and cardiac or pulmonary conditions making the need for safe, sound housing critical to maintaining their health. So, please make your gift today. Our Sisters truly appreciate all that you do for them.